Simon Reid with his father and former double world champion Brian (right), and new sponsor Adrian Fegan of Crossan Motorcycles. Two-time world champion Brian Reid’s son Simon has calmed his father’s nerves after ruling out the possibility of riding on the roads. The 20-year-old will make his debut this year in the Supertwins championship at the Irish short circuit meetings after teaming up with new sponsor Adrian Fegan of Crossan Motorcycles to ride a Kawasaki ER-6 under thevisorshop.com banner. In 2012, the News Letter revealed how Reid’s sons Simon, then 16, and Mark had tested a 10-year-old Suzuki SV650 at Kirkistown in Co Down under their dad’s watchful eye. Reid had bought the machine ‘for a bit of fun’ and at the time said he would neither encourage nor discourage his sons from taking up racing. “I’d really prefer it if they just did track days, I don’t know about the hassle of getting into full-time racing again,” he said. “But they’re old enough to know now themselves - let’s say I’m not encouraging them or discouraging them. “I’ll wait and see what they want to do themselves – there will definitely be no road racing. 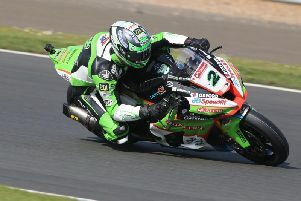 Simon, who was speaking at the Northern Ireland Motorcycle Festival at the Eikon Exhibition Centre in Lisburn at the weekend, said his goal was to one day compete in the British Supersport Championship. His vow to steer clear of the roads will allow his father to breathe a sigh of relief. “Racing is in the blood and nothing puts a smile on my face like riding a motorbike,” he said. Reid is due to make his racing bow at Bishopscourt in Co Down at Easter.